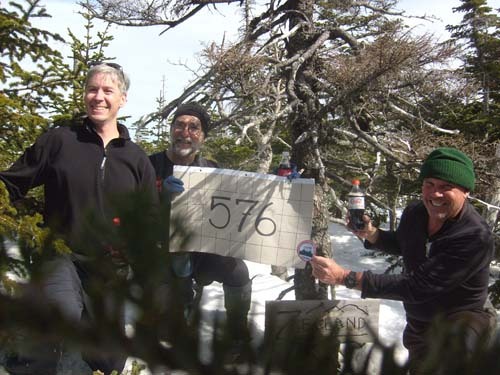 Jim completed The Grid on Zealand Mountain on April 9, 2008. He was accompanied by Ed Hawkins, Guy Jubinville, Al Aldrich, Steve Moore, Andy Hawley (Mountain Drew), Mary Ellen BaRoss (Meb), and Eric Rathbun. Jim needed four peaks to complete The Grid. It was a long day as the group hit Bondcliff, Bond, West Bond, and finally Zealand. Ed presented Jim with his Grid patch making him the first to receive a patch while on summit #576. Jim was accompanied on this hike by two other grid finishers. Left to right: Jim Towle, Guy Jubinville, and Ed Hawkins. At the end of the hike, Jim was greeted and congratulated by Cath Goodwin. 10/18/2008 - 1000th New Hampshire 4000 footer on Mt Garfield. 09/19/2009 - Completed the New Hampshire 4000 footers for the 10th consecutive year on Owls Head. He was accompanied by Ed Hawkins (who visited Owls Head for the 60th time that day), Becca Munroe, Denise Penn, Bruce Pfendler, Chuck Stielau, Ron & Pat Hiser, Dee Ressler, Thom Davis, and Michelle Kingsbury. 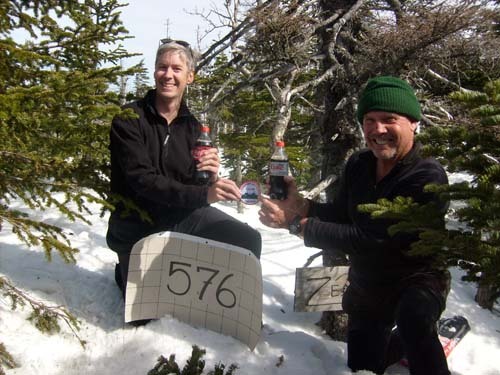 02/25/2011 - Completed hiking a 4000 footer every calendar day. In order to finish before a snowstorm Jim with his friends Robie and Dee started at 12:05 a.m., summited Mount Tecumseh at 1:45 a.m., and finished at 3:15 a.m.